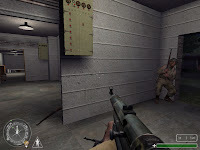 In this test map you will travel through a kind of complex after you land with your squad, Design is ok but not really above average, the author tells this was mostly published just for scripting and doesn't really shows his mapping quality. All considered it's quite well done and even if it looks a little restricted by walls or mine field it is correctly squaled and well lighted (especially indoor). 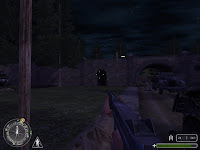 Gameplay through scripting is the most interesting part of this release objective are well crafter through your mission and qsquad experience and will through you in some nasty traps and battle (surpise when you put the bomb in the control room or when you need to pass the mine field) battle are well put together to create an enjoyable experience and make it worth to play.